← Help Us Be Leading Moms in Business! A few weeks ago I shared how Arianna Huffington Asked For My Business Card. In case you missed it, here’s the short version. My fabulous business partner, Anna Marie Etcheverria, is a speaker series junkie. 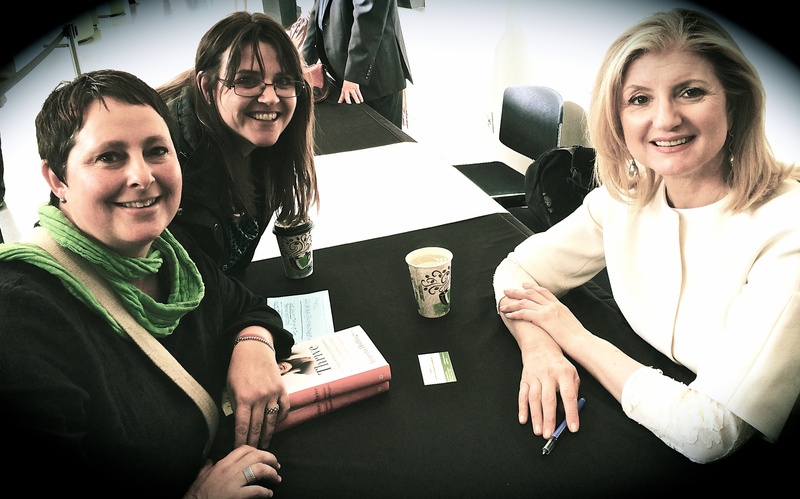 For my birthday this year, she invited me to listen to Arianna speak about her new book Thrive. We got there early, sat front and center, and were just plain giddy throughout the speech. Our purpose and mission with Duncan+Coleverria, and our telework tool, Flipside Workspace, are very much in alignment with her message of Thrive. We just felt over-the-moon inspired. We hung around for a bit, sipped bad coffee, and ended up purchasing her book. It was getting late, the traffic in San Francisco was building, and the book signing line was long. We started to talk about skipping the signing, happy and satisfied with our full feelings of inspiration. We stuck around, more mindful of the moment we were in. The result was my very first Huff Post Blog post, Celebrating Passion and Purpose. This highly personal post explains my motivation for starting Duncan+Coleverria and creating Flipside Workspace. This experience taught me opportunities really are everywhere: it’s up to you to seize them. What opportunities are you seizing today? I would love it if you would take the time to be my fan on Huffington Post. Just click the fan button on my HuffPost Blogger Profile.